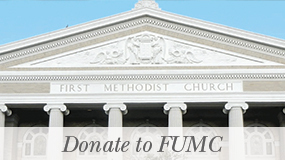 There are many opportunities to volunteer at FUMC Austin and get integrated into the community. Enjoying fellowship with other parents as we nurture our beautiful children is one of life’s greatest blessings. We begin teaching our children acolyte responsibilities when they are in 2nd grade. Our acolyte coordinator can prepare your child to serve during Sunday worship. Children from Kindergarten – 5th grade are welcome to participate in our children’s choirs. The two choirs meet weekly on Sunday afternoons during the school year from 12:05 – 1:00 p.m. They perform in worship and for special events, including an annual musical. One long-running tradition is the 4th and 5th graders’ assembly and sale of “Manna Bags,” intended to be given to those less fortunate than we are – they contain a day’s worth of nutrition as well as fresh socks and a note from a child. FUMC Kids volunteers are integral to our church families and instrumental in nurturing our children in Christian love. Many ongoing volunteer opportunities are available throughout the year. If you have time to offer, we can find a role for you.